There are several ways that history could have been brought into this commentary. The study is, essentially, a comparison between the Vancouver and Toronto regions, and the authors observe that Vancouver, unlike Toronto, is doing an adequate job of putting its population growth into the existing, already-serviced city. But the very different histories of these two city-regions – Vancouver’s population in 1921 was 117K, Toronto’s 522K – have produced quite different present-day urban forms, something that a comparison really should consider. The study’s principal shortcoming in the eye of a historian is the absence of historical perspective on the region’s planning. Regional planning has never worked in the Toronto region. The historical record is unequivocal on this. The closest thing to effective regional planning was the planning done by Metro Toronto in the 1950s and early 1960s. This was metropolitan rather than regional planning, which is to say it was concerned primarily with urban areas and the urbanization process rather than with balancing the urban and rural as a coherent region – although it did at least plan over more than one municipal jurisdiction. The Province of Ontario undertook a truly regional planning program in the late 1960s, first with the goal of managing its investments into transportation infrastructure but later, 1969-70, of dispersing population and economic activity out to the region’s periphery where development lagged. This scheme was an utter failure, a victim of its own over-ambition and public opposition to it. 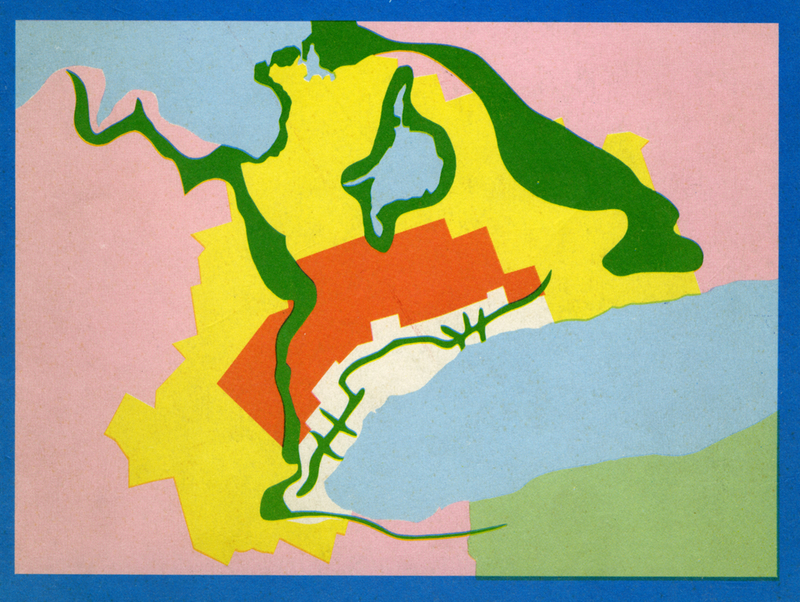 Cover of the 1970 provincial government report proposing the “Toronto-Centred Region” planning concept. It envisioned three zones: urban (white) where development would be constrained, rural (orange) where it would be prohibited, and peripheral (yellow) where it would be fostered. It also proposed to protect large stretches of natural land (green); this included a multi-use utility corridor called the “Parkway Belt” that was to bisect (not to limit, as is often stated) the urban zone. Less known, but equally telling, is Metro Toronto’s second attempt at metropolitan planning in the mid-1970s, a program that lasted several years and was ultimately diluted to irrelevance by the affected municipalities, the city of Toronto chief among them. The reasons for all this failure warrant some attention. Metro Toronto’s planning program succeeded because it was carried out when technocratic authorities and the provincial state still had power. Once local citizens became empowered in the late 1960s, and local municipalities gained more legitimacy in the 1970s – the relationship between these two phenomena remains, for me, an intriguing historical problem – sweeping, top-down regional planning programs had no hope of succeeding in the Toronto region. The insightful American planning historian and theorist Robert Fishman observed in 1990 that regional planning, if it is to succeed, would have to be in the form of a “conversation” rather than a dictate from above. This is what the provincial Growth Plan has strived to do, with the Province setting overall targets but municipalities creating and approving actual plans. I have not followed the ensuing “conversations” closely, but have heard enough to know that the process has not been entirely agreeable, and I am not surprised to learn that the objectives of the Growth Plan are not being reached. So the question becomes how, or why, Vancouver can direct its constituent municipalities to adhere to a regional plan when Toronto cannot. And the answer, according to the Neptis report (without much explanation), is that Metro Vancouver “acts as a convenor of local stakeholders and municipalities, all of which have to buy into the regional growth strategy.” (19) Vancouver evidently has a regional planning system in which local municipalities and property owners can be strong-armed into “buying in”, which is to say Vancouver seems not to have wholeheartedly adopted the “conversation” model of regional planning. This is intriguing, and the outcome of the region’s recent tax plebiscite does make one wonder, but apparently it is so. In any case, the province of Ontario certainly has adopted such a model for the Toronto region. Those who disapprove, and would prefer a more dirigiste sort of planning for the region, need to acknowledge the utter rejection of such planning in the past, at least since 1970, and also to propose how such deeply ingrained political localism could be confronted and overcome. History, in other words, deserves to be part of the discourse. The Neptis report concludes that “Ontario could learn from Metro Vancouver, by introducing a more strategic approach to growth that directs more new residents to areas with frequent transit service.” (11) That word “directs” will get a squiggly underline in the minds of anyone who knows the Toronto region’s planning history. All Neptis reports can be found at, and downloaded from, http://www.neptis.org. The commentary considered here is titled “Growing Pains”; an earlier, more thorough study is “Growing Cities”; another relevant study by the same authors, but with historical input supplied by urban political scientist Zack Taylor, is “Alberta Cities at the Crossroads”, done for the University of Calgary School of Public Policy and available as a research paper (Volume 7, Issue 12, May 2014) on the School’s website. My own Neptis report from 2007, “The Growth Plan for the Greater Golden Horseshoe in Historical Perspective” is also still available on the Neptis website. Image is from Ontario, Regional Development Branch, “Design for Development: The Toronto-Centred Region”, 1970 (University of Toronto Library).